In only a few years, small group training (SGT) has emerged as a leading profit center among many health clubs. According to IHRSA’s Profiles of Success, responding fitness-only clubs report that a median of 8.7% of total revenue is derived from small group training. Nearly 18 million health club consumers participated in SGT in 2016, accounting for 26.6% of the total consumer base. To help maximize the potential of this profit center, the IHRSA Fitness Training Report highlights three key insights (among many more) from SGT clients. 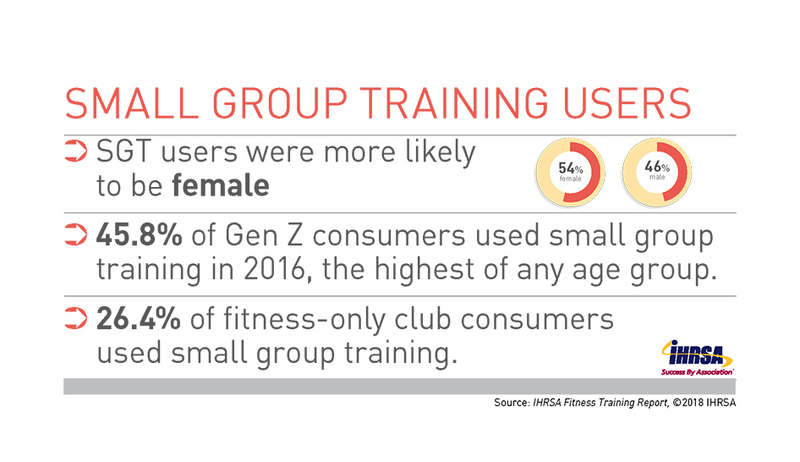 In 2016, 54% of small group training clients were female. The gender breakout for small group training somewhat mirrors the gender breakout for participation in group exercise. As reported in the 2017 IHRSA Health Club Consumer Report, 61% of group exercise participants are female, 39% are male. It appears that female club consumers are more likely to participate in group-based activities than males. As a club operator, you can develop strategies to continue engaging women in SGT. Start with identifying group exercise classes and non-club activities popular with your female consumer base. For example, if you find that yoga and running rank high in popularity, consider offering a workshop series focused on yoga for runners taught in a small group training format. Be sure that the fitness professional(s) conducting the workshop have expertise in both yoga instruction and running fitness. Generation Z consumers had the highest participation rate for SGT in 2016 as 45.8% of consumers between the ages of 6-17 engaged in SGT. Roughly 4.8 million Gen Z consumers engage in SGT, accounting for 26.9% of total participants. High SGT participation rates from the under-18 age group reflects the overall growth of youth participation in health clubs. 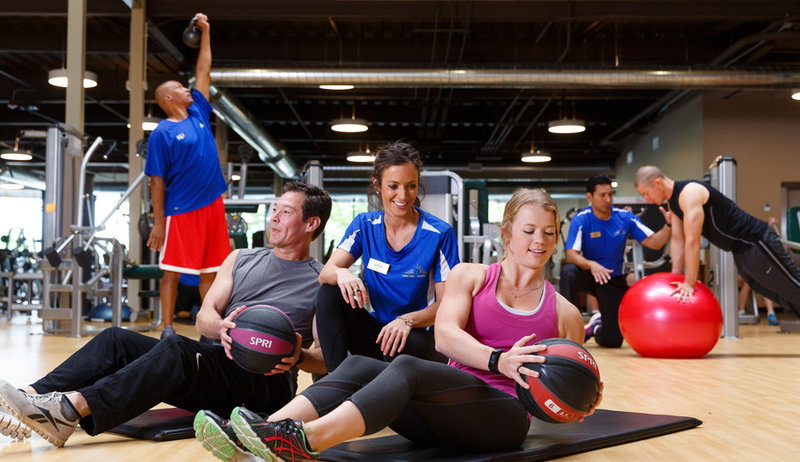 Over the past 25 years, health club membership among youth has soared by more than 300%. The IHRSA Health Club Consumer Report shows that youth are more likely to utilize a studio than a multi-purpose or fitness-only club, where they typically engage in group based activities. Operators of full-service health clubs can also profit from the surge of youth participation in SGT. Consider offering SGT workshops focused on youth sports performance, bodyweight training, and cross-training fitness programs to complement activities youth may engage in outside of the club like ballet, dance, martial arts, etc. Among full-service fitness centers, fitness-only clubs had the highest participation rate of small group training as 26.4% of fitness-only users engaged in SGT in 2016. By comparison, 19.1% of multipurpose club consumers used SGT and only 14% of YMCA/YWCA/JCC customers used SGT. Although fitness-only clubs lead full-service centers in attracting consumers to utilize personal training, participation rates lag behind studios. On average, more than one out of three studio consumers engage in SGT (36%). It’s understandable studios would have higher participation rates in SGT as their business models are focused on specialized instruction. Full-service club operators can explore ways to optimize participation in SGT. Devoting space to a specific offering delivered in a group training format such as a yoga- or Pilates-only room and creating fitness tribes led by one of your trainers may help your business increase participation in SGT. IHRSA’s Guide to the Boutique Studio Phenomenon provides a number of ways health clubs can leverage boutique strategies such as group-based training to improve member engagement and drive revenue. Read more about the IHRSA Fitness Training Report.